We have an extensive inventory of signs in use along our highways – many of which you are familiar with. But let’s take a minute to highlight some of our emergency signs – signs which you might not see very often (or which you might notice, but not be familiar with the significance of), that could indicate a potential emergency situation for you while driving. For example, Road Flooded, Washout and Forest Fire signs let you know exactly what to expect on the road ahead – most likely water and/or smoke, reduced visibility and ultimately, reduced mobility. 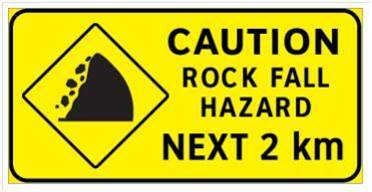 Rock Fall Hazard signs are placed in areas which have been historically active. Educate yourself on areas of our province which have an active past of flooding and landslide activity. Chances are you’re not going to be affected by a spring landslide or flood, but it is always wise to be prepared, so that you can get around safely and reliably. And should you happen to be in an area that’s at risk of flooding or another type of emergency, keep yourself informed by checking for updates at Emergency Info BC. Do you know what the yellow sign below means? 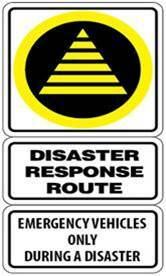 Many people who see these signs on Vancouver Island and in the Lower Mainland believe this sign indicates an evacuation route during an emergency situation BUT THIS IS NOT TRUE. As a motorist, it’s always a good idea to keep an eye on DriveBC or DriveBC Mobile. It has a comprehensive list of incidents, closures and delays marked in red on the events list and the handy map is constantly being upgraded with new features to help you know before you go. And remember, if you drive by an area where slide debris is being cleared or other road repairs are underway; please slow down in the cone zone. The people fixing the roads need to focus on their work – not worry about a close encounter with a vehicle. Do you have any pressing questions about signs that we haven’t answered here? Let us know in the comments below and we will try to get you an answer. You can also connect with us on Twitter or Facebook. What are the red squares that are appearing along side highways ? Great question! They signal to plow drivers locations where there is a feature below road grade, such as a parking lot or pedestrian walkway, so they can avoid spraying people, vehicles, etc. with snow. Hi there Jerry – and thanks for the question. Those red squares are for snow plow drivers, to indicate a below grade feature, such as a parking lot or pedestrian walkway, so they can avoid spraying people or vehicles with snow. Hope that his helps! If our different levels of government in our province along with RCMP and local police ENFORCED 10% of infractions of all laws, and 20% of those paid fines, we would have no costs for education in this province. Sadly, most laws are not enforced. We have qualified the ‘ important ‘ crimes and they take up way too much manpower of our RCMP, local police forces and bylaw officers. Perhaps the solution is to create a LAW Enforcement Team with a group of volunteers operating on a per diem basis to draw in those offenders of ‘ minor ‘ crimes. The sign that says ” Traffic fines doubled in work zones ” does not seem to work… or at least the gov isn’t standing behind it! Thanks for sharing this with us Dave. Sounds like the graduated system might mean even stronger fines for those who disregard the cone zone. Regardless, it is always important to slow down and pay attention where workers are at the roadside. As a flagger for 8 years I have only twice seen RCMP stop a vehicle in my work zone. Once it was a transport that was riding the tailgate of an RCMP ghost car and the other was a driver who pulled out to go round my line who just happened to have an RCMP cruiser 2 vehicles behind them. Needless to say this is about 0.00001% of the infractions I have seen in my work zone. Fines only work if they are enforced.